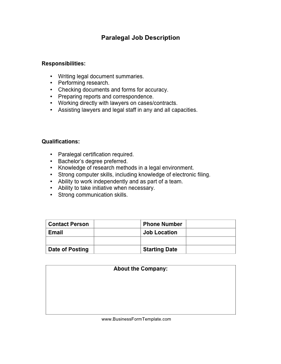 Law firms and attorneys seeking new paralegals can advertise for employees based on qualifications and experience with this paralegal job description. Checking documents and forms for accuracy. Working directly with lawyers on cases/contracts. Assisting lawyers and legal staff in any and all capacities. Knowledge of research methods in a legal environment. Strong computer skills, including knowledge of electronic filing. Ability to take initiative when necessary.